"A Set of Marches for two Clarinets, Hautboys or German Flutes, Two Horns and a Bassoon, Inscribed to The Rt. Honble. Lady Amherst by I.R. Esqr. [John Reid] N.B. For the Ease of Harpsichord Players, the first or principal part is placed next that of ye Bass", London, 1778/9. John Reid pursued parallel military and musical careers. At the time of the writing of these marches he was a major, in the 42nd Highlanders. He ultimately rose to the rank of General, and left a substantial bequest to endow a professorship in the University of Edinburgh. Reid's instrumentation for two melody instruments, two horns and bass was a standard line-up in both military and civilian band music of the period (military musicians were often called upon to reinforce or replace their civilian counterparts). No mention is made of percussion but the marches should presumably be reinforced by drums, possibly by exotica such as the fashionable Turkish Crescent, or "Jingling Johnny". The current edition includes parts for horns in the original key, and in F where different; for oboes/flutes and also for clarinets in B flat; and for bassoon. In accordance with Reid's hint on the title-page, a discreet keyboard version is provided. 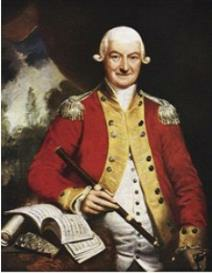 General James Robertson was commanding officer of the 16th regiment of foot between May, 1778 and March, 1788, during which period the regiment served in the War of American Independence, principally in Florida.